Kujiru Kesa (袈裟　クジル, Kesa Kujiru) is a slug shikigami and one of Garaiya Ogata's pets. They're the stage 2 boss of the haze route of Brilliant Pagoda or Haze Castle. Kujiru is bratty, overconfident and impulsive. They hold their master Garaiya in high regard and often picks fights with Kaisen, since both want to be favored by their master. Kujiru often ignores Kaisen's orders and does things on their own. Both shikigami have a fierce rivalry and are often seen insulting each other. 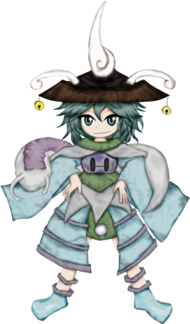 They are more powerful than your average slug youkai, and salt has no effect on them, except for olive oil. Kujiru has the ability to "divide slipperily", allowing them to make copies of themself, which is quite useful for spying and communicating with the rest of the Dragonfly Army. Which is great, because each copy doesn't really have the strength to do anything else. As seen in Garaiya Ogata's character art, Kujiru can morph into a normal slug form. Kujiru and their superior Kaisen Azuma are shikigamis serving the same master. Both of their personalities were stimulated from the last war they were in, so they gained the humanoid forms they have now. Kujiru is actually weaker than Kaisen, but their boss prefers Kujiru because they have a more practical ability. Their full name is Kujiru Kesa (袈裟　クジル). The name Kujiru (クジル) can be translated from Katakana as "to stick into and move around; to dig around in; to pick (as in, picking one' teeth)". Their surname "Kesa (袈裟)" can translate into "stole" or "this morning". According to JynX, "Kujiru" is written as "抉弄" in Chinese. 抉 means "to choose" or "to pluck out", while 弄 means "to play with", "to trick", "to make fun of", "to cause ... to do ..." or "to obtain". Kujiru has short blue-green hair and green eyes. They wear a black kasa hat with slug antennae and dresses in dull blue and green clothing, where their neck seems to be covered with a big slug. In their animal form, Kujiru is a white slug. While Taira no Chouki was training under the tutelage of Garaiya, the Dragonfly Castle appeared before Chouki, which Garaiya took as an omen acknowledging them as the New Emperor. The idealistic Garaiya wanted for the emperor to be a “hero figure” to Mugenri, but unknown to them, Chouki actually had no interest in ruling. Knowing that Fumikado will eventually come to the castle and fight for the emperor’s title, Chouki waited for them inside the castle, with the intention to kill and have revenge on Fumikado. Meanwhile, Garaiya sends Kujiru and Kaisen to recruit followers to their cause and monitor the Senri Shrine and its new employees. They were supposed to act on Kaisen's orders, but they disobeyed and went on their own. After Kujiru and Kaisen are defeated by the heroes, they go back to Garaiya and tell them what happened. Garaiya and their pets (back into animal form) fight against the heroes in order to prevent them from reaching Chouki and the Dragonfly Castle, but is defeated easily, since Garaiya was weakened due to using most of their power to enhance Kujiru and Kaisen. Kaisen is Kujiru's superior. However, they seem to have little respect for them and disobeys them, because Garaiya favors Kujiru rather than Kaisen. Because of this, Kaisen is jealous of them and both are always seen bickering or insulting each other, much to Garaiya's chagrin. Kujiru is one of Garaiya's pets. The slug holds them in high respect and often picks fights with Kaisen in order to get their master's approval. It's stated in Kujiru's official profile that they might know Shou Amanomori. After discovering that Shou's ability to induce rain is similar to their own ability, Kujiru considered letting them join the Dragonfly Army due to needing an addition to their own work-field. ↑ 1.0 1.1 Literally "slimy hoi-hoi", a play on the name of "gokiburi hoi-hoi" cockroach traps. ↑ Katsuyu is the personal summon of the Fifth Hokage Tsunade from Naruto. The name itself is taken from an alternate way to read kanji 蛞蝓 (namekuji).